Rah, rah, raspberries! Go, go, grapes! Prepare yourselves. 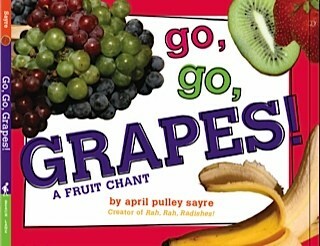 Go, Go, Grapes: a Fruit Chant will be released May 22, 2012. I’m proud of the luscious photos, which were taken primarily at our local farmer’s market, small grocery stores in our town, and a few markets I visited on travels. Several fruit parties had to be held to munch all the fruit I purchased from friendly fruit folk!